I said goodbye to everything ten hours ago. 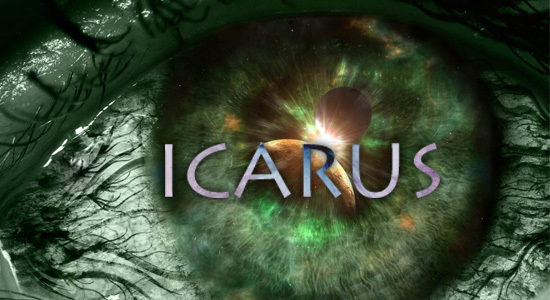 When we boarded the Icarus, I never saw the ship. There were no windows, no monitors, not even a still image to show us our new home. There was only a white hallway and men in white sterile suits. We were in our mission jumpers, similarly white but on our sleeves was a single patch: NAS Icarus 2089. It showed a streak of blue passing over a white crescent moon. We entered through a hatch that looked like some old bank vault, as white and sterile as the rest of us. When we stepped through, I expected to feel something different, an equilibrium change maybe, or a buoyancy like you do on a water-based boat. There was none of that. I stepped from solid metal plating onto solid metal plating. From there we went straight ahead through another hatch that was the same as the first. Inside was a round room filled with a number of Extra-Vehicular suits. This was a Ready Room of sorts for preparing any of the crew to go outside in vacuum should there be need. I’d been briefed and trained on the suits which were not what I expected. They were tight-fitting and moved with surprising ease. Ceramic platting was attached to the outside of the suit which gave it the look of futuristic plate mail armor. The helmet was a clamshell affair with a 270-degree field of vision. You could see just fine out of them as long as you were looking side-to-side. Looking straight down was impossible, the helmet simply didn’t move. We sat and had our last briefing from Colonel [DELETED] and Doctor [DELETED]. Then they handed us each our full assignment details, all of which we’d read before, and a complimentary box of snacks. It was a small box. The least they could do was give me a few years’ supply of Swedish Fish but it wasn’t in the budget I guess. They shook our hands and left. Then the hatch closed on us. This entry was posted in Icarus, Original Fiction, Science Fiction and tagged Alliance Navy, biotic, blog fiction, Icarus, Luna, Luna Station, NASA, Science Fiction, Time-Vortex, William Shriver. Bookmark the permalink.